No short-lived conventional copper compositions. If a diameter needs build up, Steel / Stainless steel is used, which extends the lifetime. 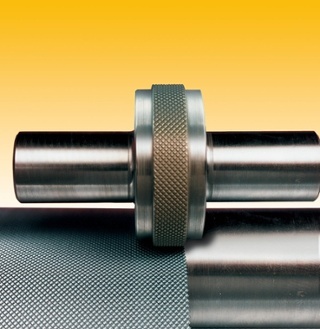 After the engraving the roll receives a special chrome coating. Tightest T.I.R. & O.D. and an even screening over the entire engraved surface for a constant screen, volume, depth, wall and angle. Multi-pass mechanical knurling. Special tools enable to engrave directly into steel / stainless steel. Standard & New engraving patterns including finer line screens (from 6 l/cm to maximum 140 l/cm. The patterns manufactured are: 45°, Hexagonal, Tri-Helical, Channellox or specials on request. Channellox or specials on request.